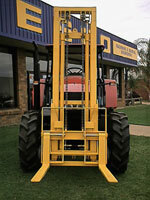 Hesco has a range of forklifts to suit virtually all makes and models of tractors. Our forklift assemblies have proven themselves to be durable and robust in a variety of agricultural uses. Distributed throughout Australia, Hesco have be manufacturing their tractor mounted forklifts for over 35 years. During this time our forks have continually evolved to suit growers and the industries changing requirements. With the safety of the operator in mind, Hesco Forklifts are OH & S compliant and use genuine forklift tynes for added strength and durability.